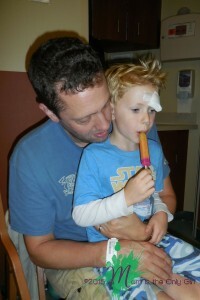 In that split instant, on just the other side of the street from our driveway, five-year-old Sweet Pea fell head first as he attempted to go around his brother. I heard that scream-cry, turned and ran. I saw my little guy laying face down on the road, still gripping his handlebars. Inside, in Hubby’s arms, he kept screaming while keeping his eyes closed. I finally got him to open them and asked how many fingers I was holding up (one) he said “three, no five”, then got sick to his stomach. The doctor at urgent care numbed the wound on his eyebrow and stopped the bleeding, but told us to get him to the ER, where they could do an MRI to make sure there was no internal damage. He then told us to replace Sweet Pea’s regular bike helmet with a skateboard helmet. He went on to explain the same thing the ER doctor said…. The ER doctor was so kind and gentle with Sweet Pea, and ended the day (literally – it was 11:47pm) by giving Sweet Pea stitches. He also told us to replace the bike helmet with a skateboard helmet and to replace Cutie Pie’s with a skateboard helmet as well. The ER doctor went on to tell us he sees so many injuries from bike falls that might have been prevented had a helmet been adjusted correctly or had the child been wearing a skateboard helmet. We all know kids don’t like the strap as tight as it needs to be. 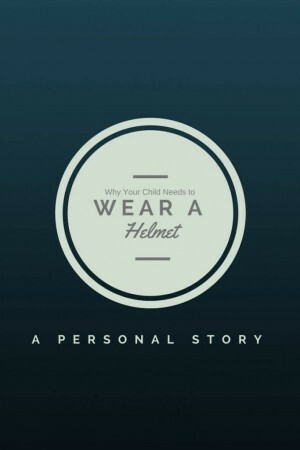 This wasn’t the case for us, though, as Hubby has personal bike-injury experience and had made sure our boys’ helmets were adjusted correctly. Doctor then explained that a skateboard helmet is created to come down further over the forehead and further over the back of the head, while still allowing ample room around the ears. This design is more apt to stay put on a child’s head in a front-fall. Bike helmets ride higher on the head in both the front and the back, which allows room for the helmet to slip back on frontal impact. He also explained that a regular bike helmet is great for adults, as adults in general don’t fall from their bikes in the same manner children do. My children wear skateboard helmets whenever they are on their scooters or bicycles, and we have a rule at our house for their friends. If friends want to ride one of our toys with wheels – they MUST wear a helmet – THEIR OWN helmet, adjusted for them. Even if it is a bike helmet. Child helmets of any type are not a one-size-fits-all deal, so there is no sharing. 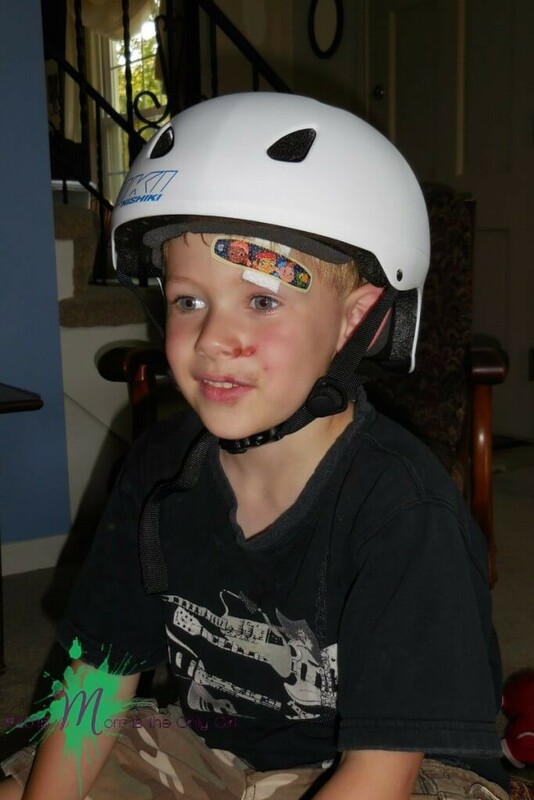 Some kids baulk at wearing helmets, but their lives are precious. It is our job as adults to keep them safe. Sweet Pea did have a concussion, with no internal injury, and was ordered to rest physically for a week (no jumping, riding bikes, swimming) and no screen time for two weeks (no computer, no TV, no iPad). He healed well, with only a small scar in his eyebrow, and no lasting emotional effects. But this was an injury that affected us all. 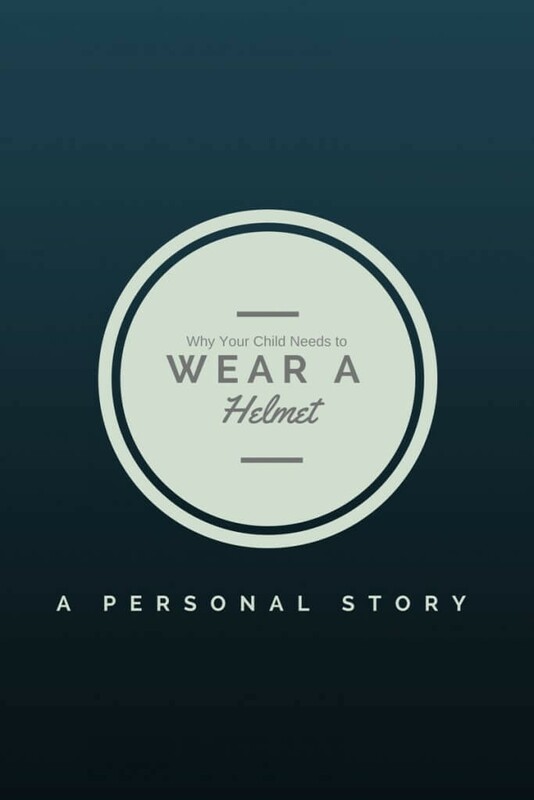 Have your child wear a skateboard helmet that is adjusted properly for them. Keep them safe.